At the conclusion of the CGU Junior Maxam Cup competition at St Austell on 26th October 2018, the prizes were presented for the 2018 CGU Junior Orders of Merit season. St Austell’s Ewan Warren completed a clean sweep taking the top prize in each of the categories winning the U18 Scratch OoM, the U16 Scratch OoM and the U16 Handicap OoM. Liam Wilson (Truro) was the runner up in the former two categories and Ryan Gregory (St Mellion) was the runner up in the U16 Handicap OoM. CGU Juniors President Alan Lund presented Warren and Wilson with their prizes. It has been a good season for Warren. 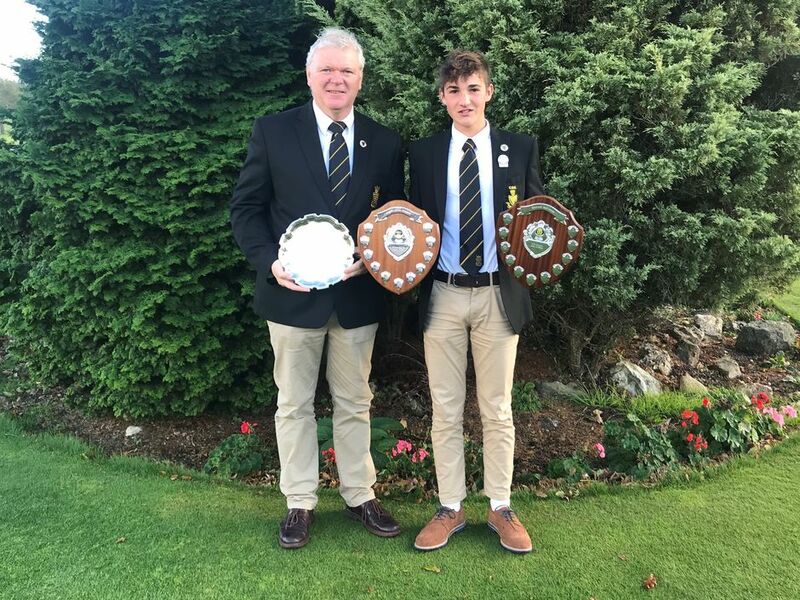 He was part of the Cornwall SWCGA Boys Championship winning team in July which then travelled to the English Boys County Finals the next month and he also won the CGU Depot Cup awarded for the best gross round in the Champion of Champions event staged in September. Warren was pushed all the way by Wilson as is evidenced in the OoM's narrow winning margins. 2018 Orders of Merit - Things are Hotting Up! The latest positions in the 2018 Junior Orders of Merit have been updated and after last Sundays event at Mullion things have really hotted up at the top of the rankings with just the one event to come. In the U18 Scratch the win by Ewan Warren (St Austell) has moved him up right behind long term leader Liam Wilson (Truro) with just 1.5 points separating the pair. This year's winner will almost certainly come from the two of them with Thomas Stephens (Truro) a little adrift in 3rd spot. D-Day will be PGA Professional Nick Williams' sponsored Junior Open at St Enodoc GC on Sunday 7th October. In the U16 Scratch element the same position exists with Wilson ahead of Warren by 2.33 points with a full 20 available at the final event. The U16 Handicap OoM sees Warren with his nose in front 65.50 by less than a point though from St Mellion's Ryan Gregory (64.83). Wilson sits in third spot here on 61.00. Please be aware the St Enodoc Junior Open is hosted and managed by the club and to enter you should contact them. There is a link below to a Poster and Entry Form. Also please note that handicap limits apply and will determine which of St Enodoc's two courses you will play on. The Junior Committee has decided which 7 events will form the Junior Order of Merit for 2018 and these are listed below. The Junior Committee determined the previous year’s OoM comprised too many events and whilst well intentioned was unnecessarily large. The Junior OoM thus returns to its former state with a smaller number of events. Choosing which events to include was considered carefully and no inference should be drawn by club opens which are not included. Year on year the Committee will review the venues. A player's best 5 scores from the 7 counting events will determine his Order of Merit position. The same 7 counting events will be used for the U16 Scratch and Handicap Orders of Merit. The respective OoMs will be updated on the Junior News page. Entries for Club Junior Opens should be made direct to the club concerned.